Back in April I ordered a clutch of new clematis for my garden, all from Thorncroft Nursery. They were destined to cover a shabby stretch of fence leading from the street to my new back door. The plants arrived in good health and were stashed in the greenhouse until I was ready to plant them out. In the steady warmth they grew so rapidly that I was compelled to get on with the job lest they take over. My new climbers have done me proud already, some reaching 6ft or more. Clematis ‘Princess Diana’, a favourite of mine, has grown especially vigorously and is still producing waxy pink flowers now. Meanwhile I’ve been a little underwhelmed by C. ‘Princess Kate’. Perhaps another season will see her produce a royal flush. By comparison, a couple of clematis purchased from Tesco for £3 each have grown very little, although I expect they will catch up with the others in time. 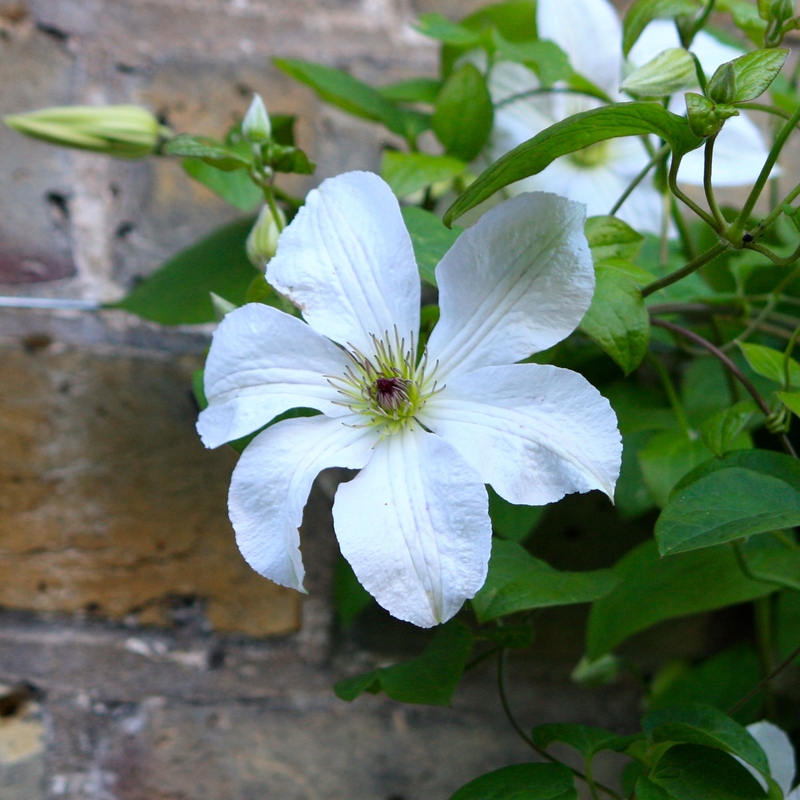 A white-flowered clematis named ‘Forever Friends’ was singled out to be trained against the wall of the house. Numerous inelegant alterations have rendered the brickwork a mess. I am hoping between the clematis and Magnolia grandiflora ‘Exmouth’ they will create a pleasing distraction from the chipped London stocks and uneven pointing. In retrospect I am not convinced pure white is the best complement for yellow brick – I may yet replace it with a variety bearing cream flowers, such as C. ‘Guernsey Cream’ – but it has performed brilliantly well in its first season. Having scaled the wall to 8ft, which is higher than the most optimistically placed support wire, it has already been flowering for six weeks. The later blooms have been smaller, but remain plentiful. Clematis ‘Forever Friends’ was raised by a renowned Dutch breeder called Wim Snoeijer and named in memory of his father, Piet. 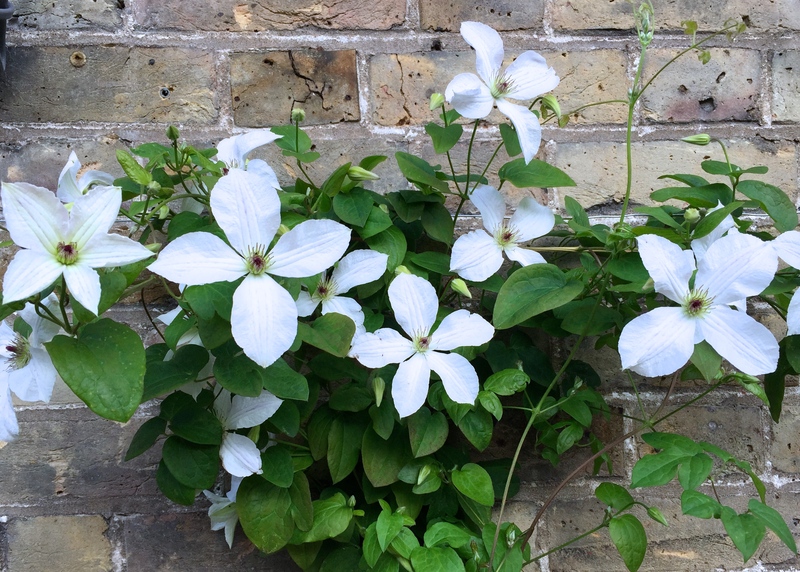 As a clematis it has been described as the ‘white Jackmanii’ because of its tough, floriferous nature. Anyone who’s grown Clematis ‘Jackmanii’ will appreciate what a compliment that is. If cut back hard in early spring, C. ‘Forever Friends’ will produce copious single white flowers with four, five or six petals, each with a distinctive reddish eye, from July until September. The satiny white petals may occasionally be flushed pink, violet or green. Like many clematis, ‘Forever Friends’ prefers to have its lower portions shaded and its head in the sun. Reaching a maximum height of about 10ft it’s the perfect climber for a fence, house wall, pergola or arch. Far from the cutesy greetings cards that share the same name, Clematis ‘Forever Friends’ is a class act with enduring appeal. Quite why it doesn’t have an RHS Award of Garden Merit (AGM) I don’t know, but I am hereby giving it my personal seal of approval. What a typically lovely post to accompany my commute this morning – not only gorgeous to look at and full of sensible plant facts, but topped off by the bonus comments about provenance and alternatives. Thanks FG! My pleasure. It’s all good learning for me too. I love researching these posts. Thank you for an informative and useful post, the photos are, as always, so crisp. What camera/lens do you use? That is very kind of you, especially as I was thinking as I uploaded them that they were not my usual standard! The main photo was taken on my iPhone, the others on my old Canon 450D. Lovely shots indeed and I’m another fan of the iPhone camera. Astounding what such an apparently basic function can do. I love clematis, especially the single ones – P.Charles out in bloom at the moment. I love its intense clear blue colour. I do have a double double one, a gift to me from a late friend’s sister. Diamantinii. 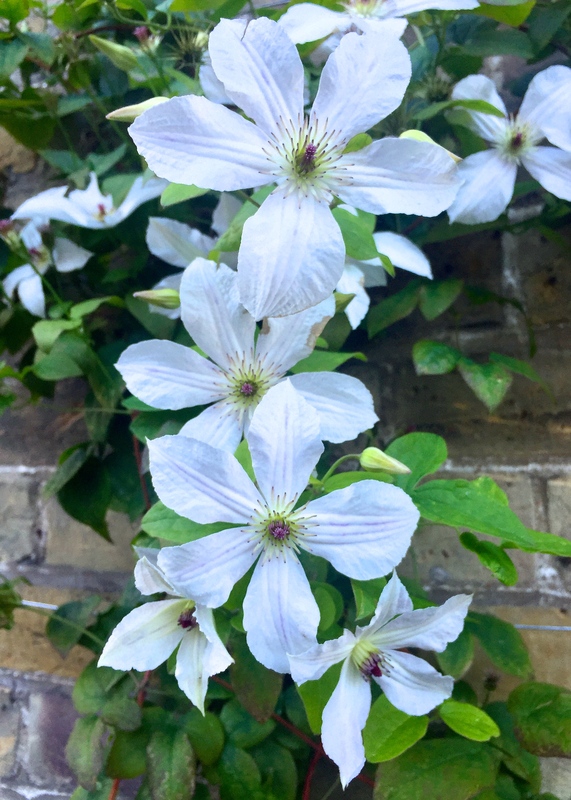 It’s so outlandish as it drapes itself over a ceanathos, both tumbling over a stone wall at the bottom of our drive – the perfect spot for such a blousey clematis!!!! It did draw lots of attention when in flower earlier this summer………… liking your list, Dan. Thanks Sally. I am missing a nice clear blue. I have ‘Happy Anniversary’ but I’d call that mauve. It’s also a little bit hidden from view. Thank goodness clematis are upright meaning there’s always room to squeeze another in! !